Mauna Loa Volcano spans a width of 75 miles (120 kilometers) across Hawaii’s Big Island. Making up approximately one-half of the entire Big Island, Mauna Loa is the largest active volcano on earth. With more than 10,000 cubic miles of rock, it has a volume 100 times greater than Mount St. Helens in Washington, and 300 times greater than Mount Fuji in Japan. The Hawaiian name Mauna Loa means “long mountain.” Like all Hawaiian volcanoes, Mauna Loa is a shield volcano, characterized by broad and gently sloping sides that result from very fluid eruptions. Driving along the Saddle Road on a clear day, with Mauna Kea to the north and Mauna Loa to the south, one is able to observe just how long and broad this shield volcano really is. When measured from its base on the bottom of the ocean, Mauna Loa rises an impressive 30,077 feet (9167 meters), making it second to nearby Mauna Kea Volcano (33,476 feet/10,204 meters) as the tallest mountain in the world from base to summit. With an elevation of 13,677 feet (4169 meters) above sea level, the summit of Mauna Loa is also second to Mauna Kea as the highest mountain in Hawaii, whose summit is just 120 feet higher. Mauna Loa is so massive it continues to sink deeper beneath the ocean under its own weight. From sea level, the mountain descends 16,400 feet (5000 meters) to the ocean floor. It then depresses the ocean floor another 26,000 feet (8,000 meters), for a total height of more than eight miles below the ocean's surface. Mauna Loa is second only to Kilauea as the most active volcano on the Big Island. It has averaged one eruption every six years over the past 3,000 years and has erupted at least 33 times since 1843. Lava flows have reached the ocean on the Big Island’s west coast (Kona/Kohala coast area) seven times. On the east side, at least twice during the 1800’s lava flowed over land that is today within Hilo’s city limits. During the most recent eruption in 1984, lava moved rapidly down the mountain toward Hilo. Within days the flow had advanced to within 4 miles/6 kilometers of the city. The flow ultimately stopped before reaching Hilo but the city has been threatened numerous times by Mauna Loa eruptions. 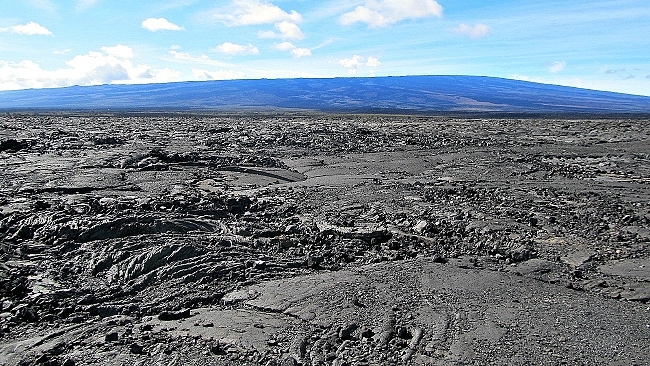 Dramatic evidence of Mauna Loa’s far-reaching impact can be seen along the southern and west coasts of the Big Island, where large intrusions of both pahoehoe and a’a lava flows are found. 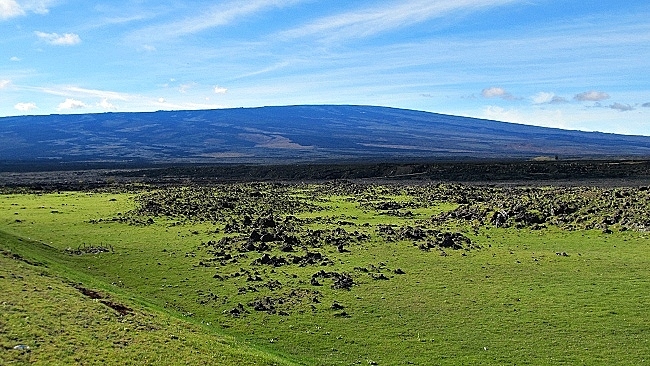 Mauna Loa Volcano serves as an impressive backdrop to many vistas on the Big Island. This is particularly true in Hawaii Volcanoes National Park, where it can be seen towering to the northwest above the Kilauea Caldera and Halema’uma’u Crater.